Sail and stay on the unique and luxurious sailing yacht 'Fate', on the Charleston Peninsula. Fate has been the #1 sailing yacht in Charleston for 8 years running with over 368 private charters in 2016 alone. Luxurious accommodations for up to 4 guests overnight while at the dock in the City Marina. Spend the evening sailing around the harbor for 2 hours then dock at the City Marina for a night out on the town. Catering is available for dinner harbor cruises or private romance at the dock. Be sure to try our 'Fate' Chardonnay or our 3 other selections, made exclusively for us by Medaloni Cellars and vineyard in Yadkin Valley North Carolina during your stay. Our High Season is April through September and we do over 50 private charters per month. All overnights come with a 2 hour crewed charter. We are a sailing charter first and cater to those who wish to sail so most of our bookings are sailing only. We do limit our overnights to just one night. If you wish to sail for more than 2 hours, additional hours are $250 per hour. Gratuity of 18%-20% is customary and not included. Overnight stay is not required if you're just looking for day sails, harbor tours, or dinner cruises. We are Charleston's #1 romantic charter yacht according to Forbes! Our luxurious 50ft Beneteau sailing yacht is meticulously kept and provides an ideal romantic getaway for two or a fun adventure for up to 6. Two private staterooms are offered with plenty of privacy for couples, and plenty room to relax on the large deck or in the shade of the bimini. A 5 star rating and the #1 sailing charter in Charleston South Carolina for 8 years running. “Fate” sleeps up to four guests, we do not allow more. Forward cabin has queen birth with a full bathroom/shower with electric head. Aft cabin has a center-line queen bed with private access to its own full bathroom with shower. The main salon has a large U-shaped dinette which comfortably seats 6 and converts to a lounge for watching TV. Fully equipped galley (kitchen) has a gas oven and cook top, microwave, refrigerator, and an array of cooking utensils. A flat screen TV and DVD player are available in each room, with the main salon equipped with a 32inch LED tv with dvd and USB for watching movies on memory stick. The stereo includes an IPod connection. Linens and towels provided. Wifi is also available. The yacht is not available for bare boat charters but we can arrange harbor cruises and overnight charters to nearby locations like Bohicket Marina. One night trip to Bohicket Marina and back are a great way to spend a weekend. The two days one night for 4 to Bohicket Marina for $2,400 plus dockage, not including gratuity. This includes roughly 6 to 8 hours of sea time each way. We always circle the island sailing both offshore and the intra coastal so you can see it all. Professional Photography available for those special occasions. Also now available for large parties up to 20 guests, our new motor yacht Kismet for 2 hour harbor cruises. Contact us for details. Captain Dustin Ryan, an accomplished sailor with long voyages over many oceans under his belt. Dustin has spent the past 18 years sailing in waters from Hawaii to the Mediterranean Sea. An accomplished waterman Dustin is an avid surfer and loves ocean sports, holds a 100ton near coastal USCG captains license, STCW 95, PADI Open Water Diver, First Responder, and Firefighter 2 certifications. Dustin is also an active Real Estate Broker with 16 years experience in residential sales. 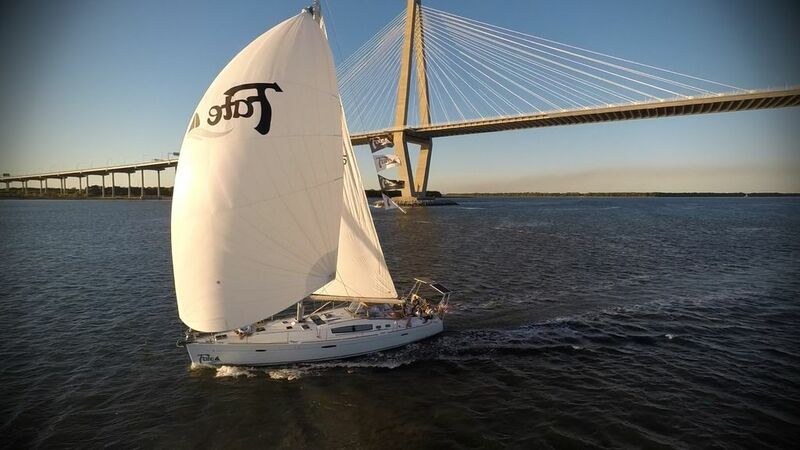 I enjoy giving others the experience of yachting on the Charleston Harbor at affordable rates. Dolphin sightings, catered dinners, sailing lessons and beautiful sunsets. Fate is professionally maintained and held to the highest standards of cleanliness. Professional photographer packages available by request for an additional $200, edited digital images will be made available for download. Sail the open ocean or swim to a private beach. Air conditioning in each cabin. Dishes, glassware and utensils are on board. There is an outside and inside dining area for 6. Sunset sail sail is required. Sailing Charters Available. Our guests have access to the City Marina's Bathhouse. Conveniently located on the docks, the Charleston City Marina’s floating bathhouse facility is second to none. The bathhouse features private shower rooms, which include a large private changing area, Corian solid surface countertops and sink, granite tile, and plenty of space to hang your clothes. The City Marina’s restrooms and laundry are also located in the bathhouse. All Rates double occupancy for overnight, additional guests $50 per person.